Hey there. Have you been enjoying CometTV? If you still haven't, you need get on that right away. They show all kinds of awesome sci-fi/horror movies and shows. And commemorate the 70th anniversary of the Roswell UFO crash this July, CometTV will be airing their Invasion: Alien Attack Movie Marathon this July 4th! Starting at 10/9 C, you'll be able to watch classics such as Invisible Invaders, and The Falling, and Strange Invaders. And just to get everyone in the UFO/Alien mood, we're going to have a giveaway! 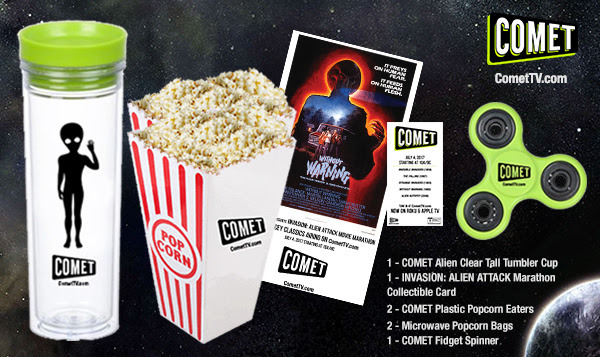 Comet TV is providing one Metallman reader with out of this world alien invasion movie prize pack! You'll get a one of a kind fidget spinner, a Comet Alien Clear Tall Tumbler Cup, the Invasion: Alien Attack Marathon collectible card, 2 Comet Plastic Popcorn Eaters, and 2 bags of popcorn! So let's get into the giveaway details! The giveaway will run from now until July 7th. Prize pack will be provided by Comet TV and will be shipped via FedEx or USPS. Sorry, no PO Boxes. 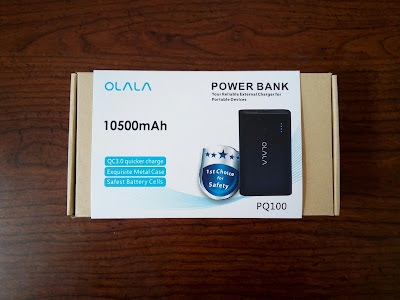 Giveaway is available to US residents only. Only one prize will be given per household. Entry is super easy, friends. Leave a comment about anything UFO or alien related. Could be about your own personal alien encounter, your own UFO sighting, or just your favorite alien/UFO movie or show. The winner will be chosen at random and will be Emailed as well as announced on my Facebook page so make sure to check in after the 7th to see if you've won! Well, friends! Let's hear it in the comment section! Good luck!